THESE HIKES capture all that we love: great scenery, classic destinations, not too many people, and at least one good opportunity for fishing! The trail leads down to Mono Meadows in a steep mile, then continues a less steep descent, crossing the Buena Vista trail into the Illilouette Canyon. From here it is a long gentle ascent up the canyon, through an area that burned about ten or fifteen years ago, with some nice views of Mt. Starr King and the Clark Range. Once the trail wends its way back to the creek, there are lots of good campsites. Upper Merced Pass Lake is lovely, and the the final climb up to Lower Ottaway Lake is wonderful, with trees growing straight out of solid granite slabs. The photo shows Lower Ottaway Lake at sunset. And you can probably see fish rising...there were so many that it was hard to take the photo and get a clear reflection in the water. A note: this is above the fire limit, so no campfires are allowed. Which hasn't prevented some people from building fires. But it should have. You can have even more fun by following this trail up and over Red Peak Pass, and down the LIttle Yosemite Valley back to Happy Isles (or across the Panaroma Trail and back to Glacier Point.) But you will run into a lot more people there! Around 32 miles rt from Mono Meadows. Slightly longer from Glacier Point. JOHN MUIR WILDERNESS: Courtwright Reservoir to Red Mountain Basin: This is a longer hike than most on this site--about thirty five miles. But it takes you through some of the best country in the Sierra, and not many other people. Add some great fishing, and this is one area we'd love to visit again. It all begins at Courtwright Dam. At over 8000 feet, this is a nice lift to the first day's hike. From there it's an easy 7-8 miles to Post Corral Meadows, where you can find quite a few campsites--and sometimes quite a few people--some on horseback. Since those first miles were relatively easy, without a lot of up and down, we chose to keep going, and camped about 4 miles further along the trail, near the Kings River. Lovely deep pools, as you can see in the photo below. And from there it is a brutally steep climb up to the Punchbowl, but the rewards are worth it. As M said when she arrived: "Wow, this is the real deal!" That steep climb also provides some spectacular meadows--lakes of green grass amid the granite--that make perfect places to stop and catch your breath, er--admire the view. The Punchbowl is a great camp for further exploration of the dismally named Disappointment and Hell-For-Sure Lakes. The fishing is very good for rainbows and brookies, and the views of the basin continually delighted us. To avoid mosquitoes early in the season, we camped on the ridge west of the lake, and enjoyed the best views to boot! On the way back, you can cross the basin and head straight down to Post Corral. If you camp there, the next day is an easy hike back out. It's about 35miles round trip. Cora Lakes, Isberg Pass and the ANSEL ADAMS WILDERNESS: The hardest part of this trip is the drive to the trailhead, which is more than an hour from Bass Lake on Beasore Road. 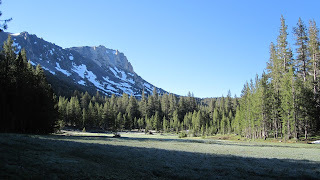 The trail takes you past Cora Lakes and then up to Sadler Lake, Isberg Pass, and into the very southern sections of Yosemite. And if you take Post Peak Pass on the return trip, you get views of most of southern Yosemite on one side, and all of the southern High Sierra on the other side. That's a photo of Banner, Ritter, and the Minarets behind Ward and Sadler lakes at left. HOOVER WILDERNESS: Leavitt Meadows and the West Walker River: This is one great area--now part of the Hoover Wilderness as of 2010, and just amazing scenery. Plus, the permits are available on a self-serve basis at the trailhead! We worked our way up the West Walker River trail, the forded the West Walker River (in early July of 2010 this was no laughing matter!) and climbed up to Fremont Lake. From there we went through Walker Meadows and then camped at Cinko Lake---which is the photo we have include here on the right. It won't have this much snow when you get here---we were the first people into the lake that year. And then past Cinko Lake, along the Pacific Crest Trail to Cascade Creek...down the creek to the West Walker again, and then we went up into Long Canyon. We were trying to avoid the mosquitoes that were so prevalent at the lower elevations...and we were more or less successful. This is a very tough, steep climb for the first mile or so...but there are both views and waterfalls. And then it opens up into a stunning meadow, shown at left. At little later in the year, we would have continued on to Bear Trap Lake...but it was too snowy for us. And on the way out, we also stopped at Roosevelt Lake and took the scenic (and mountainous) route back through Secret Lake. All good places to camp...but these lower lakes will certainly have more people than the high country. We hiked 36 miles on this trip, but that included about 8 miles up Long Canyon that you don't have to do. 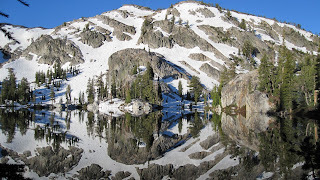 EMIGRANT WILDERNESS: Crabtree Cabin to Wood Lake and Beyond: If you like to explore beyond the established trails, then this hike is for you. You start at the same trailhead as Bear Lake, but this time you go right down the dusty volcanic slopes to Grouse Lake. This isn't a great lake for camping, as it is choked with lily pads in most places--but as the photo at left shows, it can be beautiful at sunset. The best spots are on the southern shore. Beyond Grouse Lake is heaven--a series of amazing climbs and trails that lead first to Cherry Creek, then to Woods Lake. And from Wood Lake you can really go cross-country! It's an easy hike to Karl's Lake (there is a use trail, but we found our way without needing it at all--photo is at right) and then you can just lake hop for days, through Leighton Lake and beyond. Wood Lake has excellent fishing, and the whole region just begs to be explored more...You can even extend this trip by heading north out of Wood Lake, and connecting up to the trail at Bucks Lake...and return via the route above. We liked this area so much we went back a couple of years later to explore those lakes to the south: Pingree, Big Lake, Yellowhammer, Five Acre, Red Can, Leighton and back to Karl's and Wood Lake. We loved it even more. That's Leighton Lake at right...And the whole thing is under 30 miles round trip. 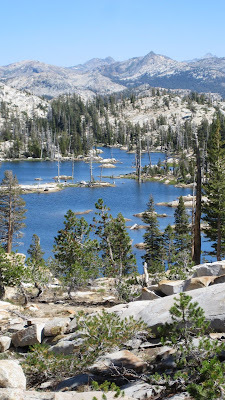 DESOLATION WILDERNESS: Lyons Lake/Lake Silvia: A nice five mile hike brings you to a stunning granite bowl with deep blue water, brook trout, and not very many people. Most of them stopped at Lake Silvia, because they heard that last half-mile to Lyons Lake was brutal. It's bad, but not that bad, and not even half a mile. And from here you can easily clamber up the peak to the west of the lake for views over most of the Wright's Lake basin. About 12 miles round trip, depending on how many times you stop at Lake Silvia.